Although many do not know, we have a satellite called Kepler German astronomer of the same name who helped mathematically to see the orbits of the planets next to our sun. Kepler’s laws, we will. Kepler satellite, is located at an average orbit, taking 30 minutes to circle the planet. Although his life was estimated at 3 years (It was launched in 2009) it has been extended until this year because it has been a serious problem with one of the gyroscopes. Kepler looks at variations of starlight to detect planets that pass between the star and, thanks to a series of photometers Schmidt series. In 2013, its four gyroscopes needed to be pointing to the right star (well, the area does not look star one, but an area of ​​10000 stars each) went to fart. How to get up there it’s not cheap (and least fix gyroscopes) NASA used a new method to fix or at least patch it: he asked the scientific community worldwide ideas to see if they could think of a patch. 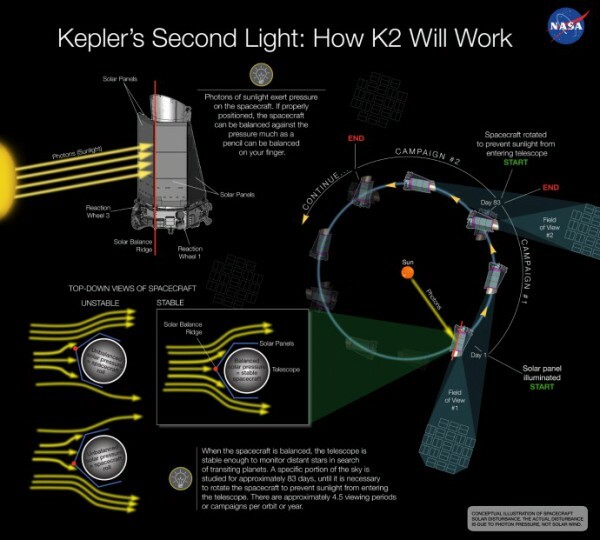 And if he came up with a great idea, called “K2 mission” it is to use solar panels as evidence to guide the satellite. The idea is this (you see in the picture). Light, like duality, photons are particles have mass hitting. As mass particles can move things hitting (with a long time …) with which can be detected as soon as hit the solar panels if there is more on one side than the other. Calculating “the hit” and keeping in constant orbit (in the area where the sun) can orient the satellite to the sun, always in the same way. Best of all, it works well and is orienting said satellite (although they have to make an average of 4 per orbit corrections, which makes it go to run out of fuel in all) giving a little more life to Kepler. Now it is estimated that in 2016 will be replaced by Tess (Transiting Exoplanet Survey Satellite) that is intended to be launched in 2017. The difference Tess about Kepler is that the former can track larger areas of sky (practically an arc of 160 degrees while Kepler was not even at 10 degrees (which is much, to deny it). It is hoped that Tess arrive to find about 100 thousand exoplanets, Kepler when they have been around 3000 (yea! ).